Final amount collected from this fundraiser was €2,370.50. A big thanks goes to all those who attended and helped us raise this money and to GO for supporting the event. On Thursday 28th July FACES organised a BBQ at the Suncrest Hotel, Qawra. This event was well attended with 104 guests enjoying the breezy outside setting overlooking the sea and the plentiful and varied food choice. A raffle with 22 different prizes at stake ended this pleasant evening in a fun and for several attendees a lucky way! Through this event we managed to raise the sum of 1070.27 Euro to be spent on the group’s ongoing projects. A heartfelt mention of gratitude goes to the AX Foundation and the management at the Suncrest Hotel for their kind help in organising this fundraiser. On a Friday evening, 8 football teams participated in a 5-a-side football tournament organised by FACES as a fundraiser at San Gwann FC football grounds. It was a competitive affair played out in a friendly atmosphere with the final being contested by Ta' Demarco vs Monsters Inc. with the former running out as winners. There was also a good turnout for the one hour Zumba class organised in one of the pitches with participants sweating and toning up for a charitable cause. Through this fundraiser we managed to raise the sum of 566.40€ for our projects in Kenya, Tanzania and Peru. A heartfelt thanks to all those who turned out on a hot summer evening to excercise for charity. For the fifth consecutive year FACES published their annual calendars. These 2011 FACES calendars were on sale over December 2010 and January 2011 outside Attard, Balzan, Ta’ l-Ibragg, St Julians and Marsa parish churches and Our Lady of Mt Carmel Church in Balluta. A handsome sum of 3595.05 Euro was collected from these sales and these funds will go towards our current project in Nakuru, Kenya. Our heartfelt thanks goes to the general public for their support as well as the clergy of the respective parishes. We would also like to express our gratitude to Redorange for sponsoring the publication of our calendars. 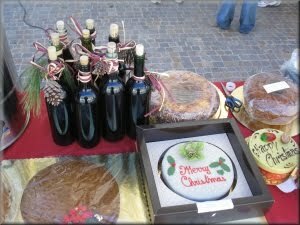 On a sunny winter’s day at Tigne’ Point, FACES volunteers spent the day meeting Christmas shoppers who stopped by our stand to taste homemade mulled wine, buy Christmas cakes and sweets and express their interest in the current projects FACES is undertaking. Through this activity we managed to collect the considerable sum of 1,097.43€ which will go towards the running costs of our orphanage, Dun George Preca Home in Nakuru, Kenya, as well as the educational fees of all the children resident in this home. We would like to express our immense gratitude for the help and support provided by a number of confectioneries and generous individuals, making this activity a resounding success. 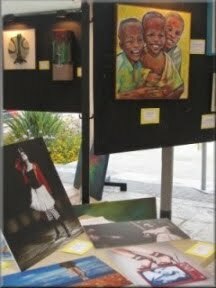 On Saturday 17th and Sunday 18th April, FACES organised an art exhibition at the Foyer, Hilton, St. Julian’s, Malta. 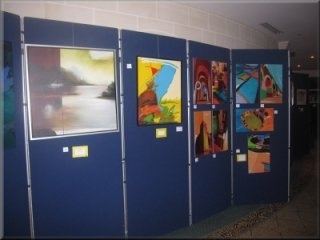 A number of works of art, generously donated by a number of established and upcoming local artists were exhibited. 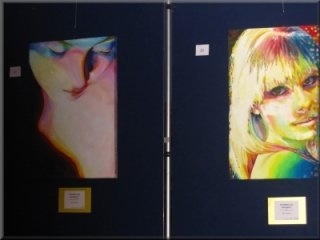 This event provided the individuals who attended, with the opportunity to savour the local artistic scene over a glass of wine in a stylish and relaxing ambience and total proceeds of 2,813.63€ were generated from this activity. We would like to thank Hilton Malta, Casapinta Design Group and Emmanuel Delicata Winemaker Ltd for their invaluable support in the organisation of this activity. 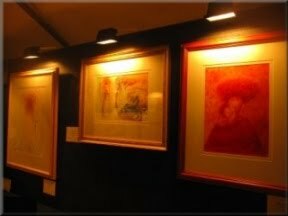 Art for Charity, held from Friday 25th June to Monday 28th June at Valletta Waterfront, was the second art sale organised by FACES this year. 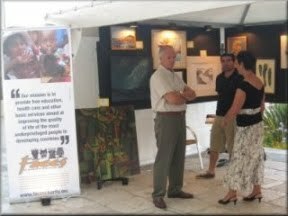 Exquisite art work was enjoyed in this attractive outdoor setting, an ideal summer cultural event for locals and tourists alike. Total proceeds of 3,190.85€ were generated from this activity. We would like to especially thank VISET for their help and cooperation in organising this event,‘I Fratelli’restaurant for their support as well as all the people who attended this activity helping to make it a great success. The funds generated from these two fundraising activities will be put towards the FACES on-going projects in Kenya and Tanzania. At the same venue, on Saturday 26th June Parliamentary Assistant Charlot Bonnici presented 9 newly-formatted laptops generously donated to FACES by the Ministry for Infrastructure, Transport and Communications. These laptops will be of invaluable help in teaching basic IT skills to students suffering from lack of basic educational opportunities in Buza, Tanzania and facilitating the educational development of children residing in FACES’ St. George Preca home by providing them with daily internet access. Lastly, we would especially like to extend a heartfelt thanks to all the artists for their generous donation of eye-catching art pieces without which these activities would not have been possible. "Pain is only temporary, Pride is forever......"
On the sunny morning of the 28th of February 2010, it was a highly emotional moment to observe around 30 athletes make their way to the start line to represent FACES in both the Malta Half Marathon and the Walkathon. This event saw the largest ever athletic gathering on the Maltese Islands; over 1,400 participants enrolled for the event. FACES was proud to be the second most represented voluntary organisation. Most of the FACES runners took up training for this event with the sole purpose of raising funds for the organisation, knowing that every cent collected was going towards the Tanzania project. It was admirable to watch these people take on such a noble challenge. A good proportion of them had never previously run for more than a few kilometres at a stretch. But the dawn of the New Year saw the beginning of their training, making this challenge a reality. With determination they battled through the cold winter months, building enough endurance to ensure that each member of the group finished the race/walk, down to the last metre. The other participants who raised funds for FACES consisted of older experienced runners, who all firmly believed in the goal FACES has, to raise enough funds to support the educational and medical needs of Buza, a slum area in Tanzania. That morning, FACES gave an excellent example of team spirit. Initially by stretching together as a group in the Rabat playground, then running together in groups throughout the race. The climax was reached at the finish line when a number of tired but jubilant runners/walkers entered the finish line holding hands. The sportsmanship of these participants left a positive impression on the crowd. One must not forget the lively boost given to all FACES participants when passing the colourful cheering point on the Mriehel by-pass centre strip. This drab area was suddenly turned into the talk of the town, as passers-by looked on excitedly at the numerous balloons and FACES banners held by these dedicated members, who made sure every one of their athletes received a moral boost by the cheering and pumping of horns as they ran/walked past. All participants confirmed that this was a much needed and appreciated form of encouragement as they were reaching the mid point of the race on the cloudless, lovely sunny morning and fatigue had started taking its toll. We hope that next year more people will join the FACES stampeders team and collect sponsorships by participating in this event, whilst promoting sports and a healthy lifestyle and learning for themselves that impossible is nothing. FACES would like to thank all those who supported its project through their sponsorships and once again would like to congratulate all who participated in this year’s event and succeeded in turning every obstacle that came their way (be it in training or during the race) into an opportunity of growth. "Success is to be measured not so much by the position that one has reached in the race but by the obstacles which he has overcome while trying to succeed....."
For the 4th year running, FACES have published their annual desk calendars. The calendars which depict the striking faces of children we work with, serve to raise funds as well as an awareness of the group. Selling at a price of 5€ this year, these calendars were a huge success with all of the 600 published being sold. 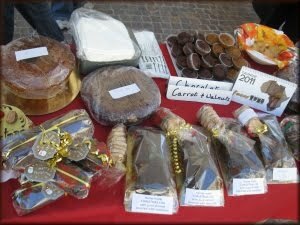 For this, we thank all the regular buyers as well as the general public for sales in front of Attard Parish Church and Our Lady of Mt. Carmel Church in Balluta (Sunday 27th December 2010) and Balzan Parish Church (Sunday 3rd January 2011). Thank you always for your generous support. 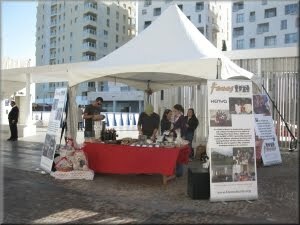 On Saturday 19th December a stand was set up for the day at the entrance of Baystreet, St Julian’s. Volunteers met up with many busy Christmas shoppers who stopped to taste the lovely homemade mulled wine, buy cakes for their loved ones, try their luck with a raffle ticket for a hamper, donate or simply chat about the aims of the project. We would like to thank the generous public who supported one of FACES' causes (project in Buza, Tanzania). The grand total collected from this activity was 683.24€. We would also like to thank all the volunteers who on that day gave up time from their busy schedule to run the stand and make this activity possible. 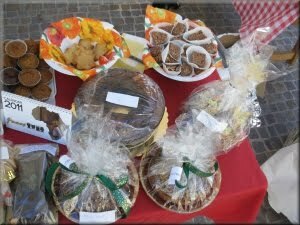 On Saturday and Sunday 3rd and 4th October FACES organised a raffle ticket sale in front of the Hal Balzan Parish Church. Prizes for this raffle included a meal for two and a number of vouchers which were kindly donated by a number of sponsors. Thanks to the generosity of the public the considerable total amount of 490.35€ was collected. We would also like to thank the Balzan Parish whose collaboration and support made this fundraising activity possible.